This blog explains how internally a ArrayList stores data. To simplify the actual ArrayList implementation I have created a custom ArrayList class with minimum methods to add and get the elements. The ArrayList here uses generics and can also be instantiated without the generic parameter as allowed for java.util.ArrayList class. 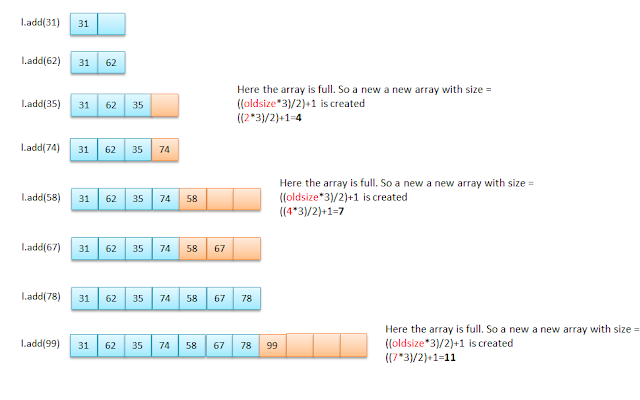 The class here has a array of Object class with fixed size initially just like the ArrayList class and the array grows as the elements are added to it. To know more about Java Collections framework read Java Collections Internal Working. i read the arraylist size increased by 50% ie if size 2, it will grow to 4. From latest Java versions, new size calculation is updated to size8*2 (double the size).